Two Pallottines confreres Frs. Susai Kannu, SAC, and Arockiasamy, SAC have started their work in the Archdiocese of Cape Town in July and August 2004 respectively. They were placed in Corpus Christi Catholic Church in the month of August by the Most Rev. Lawrence Henry, Archbishop of Cape Town for initial experience and exposure into the culture of the land under the guidance of a priest of the Diocese. Frs. Susai Kannu and Arokiasamy were officially appointed as the Parish Priest and the Assistant Parish Priest respectively in January 2005. After the transfer of Fr. Arokiasamy to Merryville, Fr.Michael Clement, SAC, was appointed as the Assistant Parish Priest of the parish on May 22, 2006. 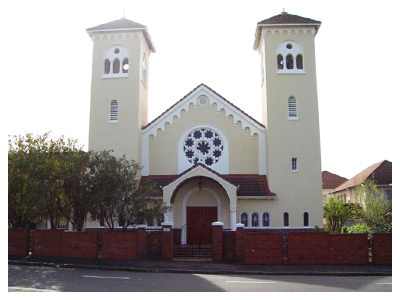 The foundation stone of this Church was laid by the late Archbishop of Cape Town Most Rev. Francis Heinemann SAC, the first Pallottine who came as a missionary to Cameroon in the year 1913, was ordained Bishop and then went back to Germany because of the world war. Later he was appointed as the Archbishop of Cape Town in the year 1922. Corpus Christi Parish is a well developed parish consisting of 1185 families, a Dominican Chapel, which is considered as the Sub-station of the Parish, three Dominican Sisters' communities, five Dominican Schools, two Government hospitals and two private hospitals, five retirement homes, 28 Associations of the Parish besides the Parish Pastoral Council and Parish Finance Council. Our priests are chaplains to two schools, four hospitals, and all the Associations of the parish. It is a parish of mixed community. God has placed our confreres in the midst of this community and this diversity adds to the uniqueness to the parish. Besides regular ministry in the parish our confreres are also involved in special ministries: Fr. Michael Clement is the chaplain of the Legion of Mary in the Archdiocese. Fr. Susai Kannu involves himself in Prison Ministry and also the chaplain of the Knights of Da Gama in the Archdiocese. In this manner our confreres have begun well in the Corpus Christi Catholic Church both pastorally and administratively. In 1830 the Catholic population of Sag Harbor numbered fifteen families including young men, laborers and servant girls living with Protestant families, in all about seventy-five People. There is no record that a Catholic priest had ever set foot in Sag Harbor up to this time. The nearest priest was in Brooklyn. Mr. Michael Burke, filled with an ardent desire to keep alive the spark of faith, opened the doors of his home every Sunday morning to the faithful few and with them recited the Rosary, the Litany of the Saints and other prayers; read for them the gospel and epistle for the day. 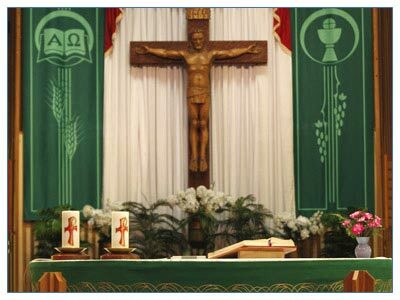 By this means they united their intention with that of the thousands of priests throughout the world who were every Sunday offering the Eucharistic Liturgy as a united prayer of thanksgiving. In addition to this, Mr. Burke regularly assembled the few Catholic children at his house and, assisted by his devoted wife, instructed them in the principles of religion. 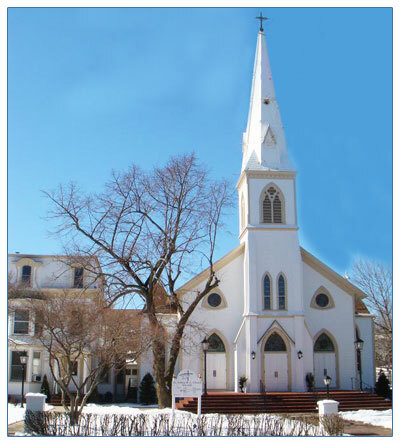 Owing to the efforts of this pious layman, there were many who, in their later years of life, remained true to the fold of Jesus Christ In this humble manner, Catholicism was kept alive in Sag Harbor for many years before there was any prospect of either having a priest or church. The first priest, who subsequently came, in 1840, was Reverend Andrew Byrne, then pastor of St. James Church, New York and afterward bishop of the diocese of Little Rock, Arkansas. He said the first Mass in this church and had the honor of selecting a name which was also his own name. The year 1859 marked the arrival of the first resident priest at Sag Harbor. The Reverend John J. Hefferman arrived and began work on what is our present church. The cornerstone was laid during ceremonies on Sunday afternoon, June 16, 1872, with Bishop Loughlin present. Over six hundred dollars was subscribed by local residents towards the new church building, which replaced the old building at the corner of Glover Street and Long Island Avenue. Queen of the Most Holy Rosary was built in October of 1911. In July of 1915 the church was dedicated by Most Reverend Charles McDonnell, the second bishop of Brooklyn. In June of 1922 Rev. Alexander Corbach was appointed the first resident pastor of Queen of the Most Holy Rosary. In December of 1924 the final payment on the new rectory was made. The cost was $20,772.80. In September of 1938 a devastating hurricane swept through the Hamptons. Our parish church had its steeple bell blown down. A gaping hole was torn in the roof and the west wall weakened slightly. Tie rods across the nave corrected this problem. In February of 1953 Rev. Joseph Rapkowski became the pastor of our parish. With great affection he was known simply as "Fr.Joe." He took a special interest in a promising sandlot player by the name of Carl Yastrzemski. In 1960 Fr. Joe purchased 10.9 acres of land contiguous with the church property on the north, for the sum of $20,700. In January of 1979 Rev. John Lynch became the appointed pastor. Msgr. John hoped to build a parish center but ill health prevented the realization of this dream. He passed away in April, 1996. 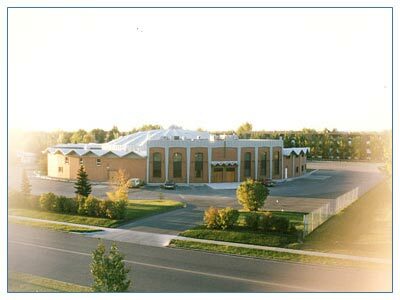 Our Lady of Angels' Parish belonging to the Archdiocese of Edmonton, Canada, currently under the care of the Canadian Delagature has entrusted this parish to the conferers of the Assumption Province in August 2005. Currently Fr. Jwanes Reddy was the first Pastor from India and Fr. Fransis Mariappa is the present Pastor. 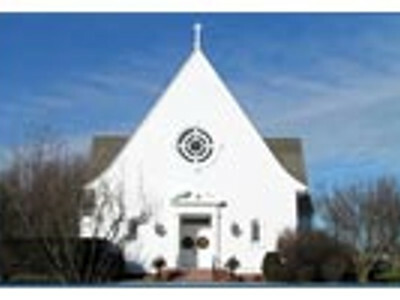 St. Cecilia's Parish is a young parish. 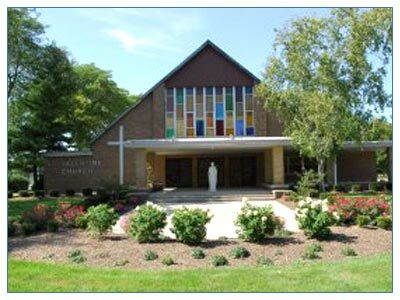 It was in 1963 that Bishop Carroll erected St. Cecilia's Parish with FatherSteveMolnar as its founding pastor to provide spiritual care for the many families who moved into this area. It came about by dividing St. Gerard's Parish, erected only in 1960, along Macleod Trail. The boundaries were: Macleod Trail on the West; the Bow River on the East; a line along about 78th Avenue on the North (dividing the Fairview district, the other part belonging to St. Anthony's), and Anderson Road on the South. The Earl of Egmont who had donated a property to the parish asked to have the church built in honour of St. Cecilia. The church was completed in 1968; it had been Father Molnar's dream to have it resemble the Benedictine Cross, round as the Pantheon so that everyone could be close to the central altar, with extensions West, North, East and, later, to the South. 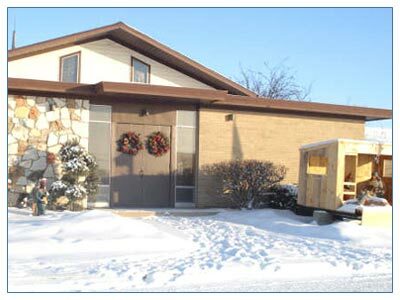 In 1985/86 our present parish centre was added to provide facilities for a rich parish life. Throughout these years we have been blessed with many faith-filled and committed parishioners who made our church a house of prayer and our parish a true community of faith. We see ourselves taking responsibility for the well being of our community and for the Church of Calgary. Our dream is to reach out in an apostolic spirit, for the Lord's blessings to be with all. TAKING OVER OF TWO NEW PARISHES IN THE ARCHDIOCESE OF DETROIT, U.S.A. It is about two years now that members of our Province are serving in the Archdiocese of Detroit. The Archdiocese is happy with our work. They are now entrusting two Parishes to us and the initial contract for both Parishes will be for a period of six years. They are Our Lady of Loretto Parish and St. Valentine Parish. These two parishes are close to each other. 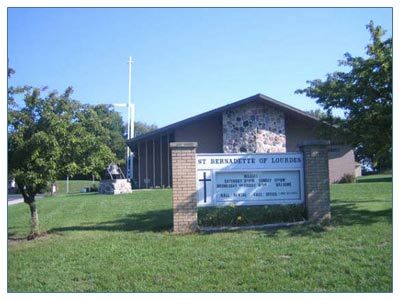 Our Lady of Loretto Parish is situated in Redford. It has about 950 families and the school there is closing this year. It is a blue collar neighbourhood and the people feel very connected to their parish. Fr. Ralph Besterwitch, SAC, was appointed as the Pastor of this Parish from July 01, 2007. Fr. Socorro Fernandes is the present Pastor. 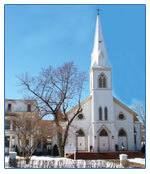 St. Valentine Parish is also situated in Redford. It was founded in the year 1947. Its mission statement reads: "Guided by the Holy Spirit we strive to live and share the Good News of Jesus Christ. As a Catholic community we welcome, serve, teach, reconcile, give comfort and hope in the spirit of St. Valentine." The parish has some 1500 families/households. They are mostly middle class and blue collared. The parish has a Grade school (Grades 1 through 8). 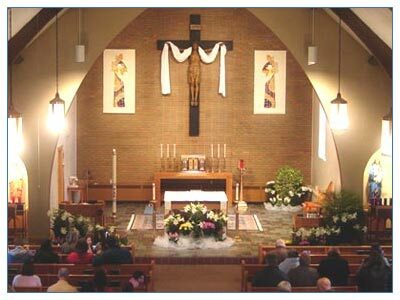 It is a traditional and loving community that is proud of its history, traditions, school, catholic devotions, etc. Fr. Paul Coutinha, SAC, is appointed as the Pastor of this Parish. 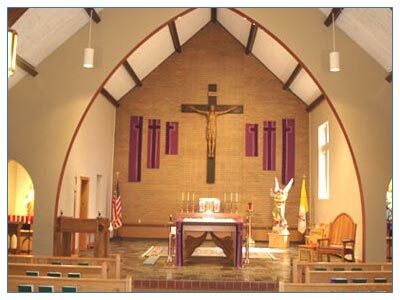 The church of St. Bernadette of Lourdes in Stanton was dedicated in 1963 with a seating capacity of 280 people. Now it has 150 families registered. This is a dynamic parish with a great scope for the future. 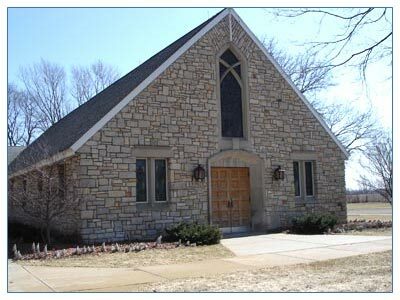 The church of St. Margaret Mary in Edmore was dedicated in 1963 with a seating capacity of 175 people. Now it has 90 families registered. This parish is predominantly of retired people. Fr. 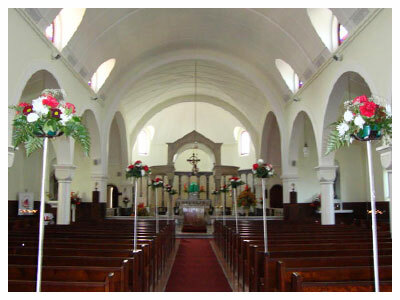 Anthony Britto SAC, the pastor of both these parishes, took charge on 1st July 2008. These parishes are tenmiles apart from each other. These parishes are in the Diocese of Grand Rapids. In 1885, St. Michael's Catholic Community, Brunswick became an independent parish in the diocese of Grand Rapids, Michigan. Located in the suburb of the North West region of the Diocese, its glowing flame inspired hundreds of people to embrace the Catholic faith. Although Dutch reformers were predominately present in this area then, they failed to convince the few die-hard Catholics with their teachings and doctrines. Immigrants from various parts of Europe, who found their livelihood here, enriched their strong faith in the ways that were popular to them. What once began as a small parish, having withstood all of its trials and turmoil, gave way to two more parishes and a mission station. The parish is surrounded with the natural beauty of many lakes and maple trees.These small lakes make a festive appearance during the spring and summer seasons as many flock to spend their week-ends and vacations here. With fishing and boating to occupy their minds, the vacationers are able to relax from the hustle and bustle of their daily activities. Farming and agriculture are the primary occupations helping the people to earn their daily bread. Every family treasures their ancestral possessions and preserves them for future generations. In that way, their family spirit needs to be profoundly admired.